In a couple of weeks I'm going to Manistee, MI, a beautiful small town on Lake Michigan with an active Main Street DDA program and some lovely shops. They've hired me to spend a few days working with them on Customer Service. When I get to town, I'm going to visit a few stores and ask them about their hopes and dreams, ask them about their challenges, ask them how they define Customer Service. This session will be a workshop where each participant will be led through a process of uncovering the 3-4 Core Values that drive both them and their business. We will use three different techniques for helping each participant create his or her own Character Diamond. Depending on time, we will have each person share his/her diamond with the entire class. We will at least have a few people share so that others can learn from the examples. Purpose: To create a framework around which every element of Shareworthy Customer Service (SCS) is derived. (thanks, Tim Miles, for the word Shareworthy). This session will illustrate the different ways in which a business can generate Word of Mouth – including Over-the-Top Design, Over-the-Top Service, and Over-the-Top Generosity, Secrets and Surprise. Participants will be given a number of examples of each, then asked to come up with one form of Generosity/Design and one method of Sharing Secrets that they can easily incorporate into their business. Purpose: To show what it takes to get customers to actually Share their experiences. This session will teach the participants how to plan a training program for teaching their staff everything they are learning today. The seminar will show them the basics for planning meetings and trainings that the staff will look forward to attending, how to make the information stick, how to prep the staff for meetings/trainings, and how to follow-up after the meeting/training is over. Purpose: It is one thing to learn it yourself. It is completely different to be able to teach it to others. Since most participants will have a staff, this session is to show them how to create staff meetings and trainings that will help them teach this to their frontline workers. Purpose: To put into practice what they have learned both on creating a staff training session and on SCS. To create camaraderie and bonding. To have fun. 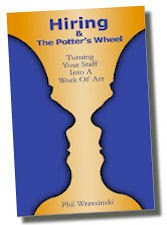 This session will show the participants how the steps a potter uses to create a work of art can be applied to the hiring and training process, turning your staff into a masterpiece. The session will include creating a non-teachable traits list for a variety of positions in your company, including some interview questions to help draw out those traits. Purpose: To illustrate the point that all the training in the world won’t help if you don’t have the right people in place. To show how to consistently find the right people. To give the participants a blueprint they can follow for hiring and training. After creating their trainings, each group will share their plan with the rest. After presentations, the plans will be copied/shared for everyone to use with their own teams. Purpose: To help each participant have a developed plan for teaching SCS to their staff. To make sure we have taught our points well. To give a review of everything discussed throughout the day. Yeah, it is going to be a fun, packed day of learning. And when we're done, Manistee will never be the same. Would your town be interested in a program like this? PS If you're anywhere near the west side of northern, lower peninsula Michigan and want to attend, contact Travis Alden. If they have space available, he might just let you in.